You can download the files for this tutorial here. The .indd file in the InDesign files folder is a finished version of the file; you can start from scratch and work toward this. Also, you need to install the Adobe Content Viewer app to view on tablets. Just open the .folio file with the program. This is an overview of the Digital Publishing Suite (DPS) tools in InDesign. With them, you can make interactive PDFs that can be viewed on iPads, Kindle Fire/Nook and Android tablets. I have included an example file that I made in InDesign. This tutorial assumes that you have some experience with other Adobe programs like InDesign, Illustrator and Photoshop. If you do not know much about InDesign, don’t worry! This tutorial will go over each part in the process step-by-step. 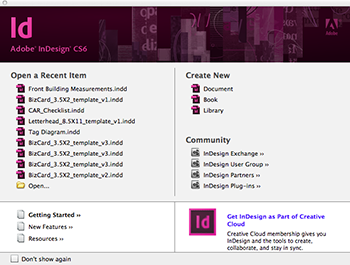 For more InDesign and DPS help, check out the official documentation on Adobe’s help site. 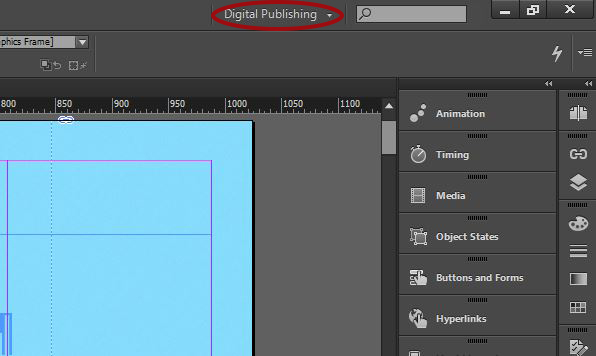 When you create your file, make sure that you select Digital Publishing from the Intent drop down menu. I choose the iPad preset for the page size, for simplicity’s sake. The rest of the settings are just fine, though I usually like to have some page margin and I like to work with a three- or five-column layout. You should now switch to the Digital Publishing layout so that you can quickly and easily use the various tools. I also find it useful to open the Paragraph Styles, Character Styles and Object Styles panels. Have you ever wanted to create graphical elements directly in inDesign? 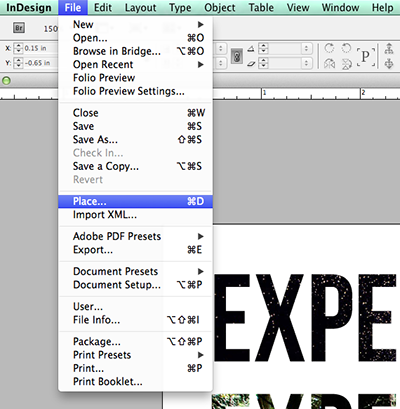 This tutorial will teach you how to have an image bound within text using the pathfinder tool in inDesign CS6. This technique will help decrease the amount of time spent opening other applications, creating and editing files, saving files, closing the program, and finally placing the element on the page giving you the same end result. Instead of the text having a font color, the image will fill the area. First, open the application. Choose to create a new document. Feel free to use any settings you prefer. I decided to go with a half letter in a landscape orientation. Click OK. Select the rectangle frame tool. Click anywhere on the document and drag (while still holding down the click) to the size you desire. The image will be placed inside this frame. Now it is time to place the image within the rectangle frame. While the frame is still selected, go to File > Place. Find and select the image you would like to be the background of your text. If your image is larger than the rectangle frame and you would like to reposition, use the selection tool to double click the rectangle frame. A brown bordered box will appear around the entire image. Rearrange and resize for desired look. Click anywhere on the page to escape the brown bordered box. The ability to automatically add page numbers to a layout is one of the many easy, convenient features InDesign has to offer. There are many reasons why you would want to automatically generate page numbers in your next project, so whether it’s a magazine, a booklet, or individually numbered items, the simple steps here can help. 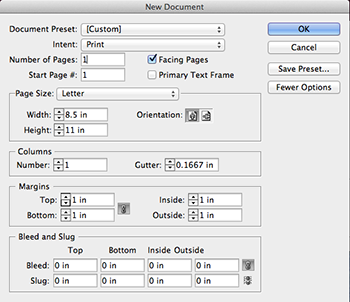 Create a new InDesign document, with your margins and dimensions. Page numbers are not limited by dimension and can be applied to a document of any size. Navigate to the Pages panel. If you cannot view this, you can make it visible through the Window dropdown. Click Window > Pages to display it. In the Pages panel you will see the top section contains the A-Master; this is where you will be creating your page numbers. Any changes made to the A-Master will apply to all pages that contain that master layout. Below this section are the live pages in your document. Double-click the A-Master to work on this page and add your page number placeholder. Once in here, go to your Type tool to create a text box to house your page number. Click into the text box. Click Type > Insert Special Character > Markers > Current Page Number. This will generate a letter, but don’t worry -- this is just a placeholder for the number which will generate on your live pages. Any changes to the text you make in this box (font, size, weight, etc) will apply to all the locations that use the A-Master to generate page numbers. 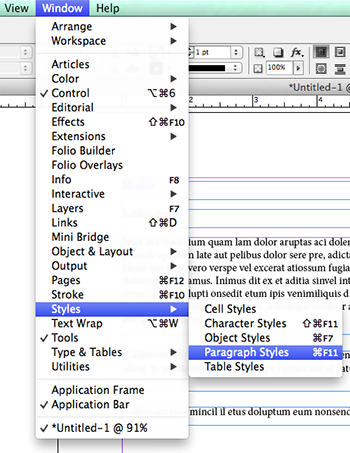 When designing and editing page layouts in inDesign, fonts can become messy without the help of paragraph styles. How many times have you re-read through a document you created and noticed a sentence in the middle of a paragraph happened to be a different font-size? How much time have you wasted scanning a ten page document adjusting styles manually? Paragraph styles can help speed up the process of editing font styles and decrease the amount of display errors in your document. In this tutorial I will go over the basics of paragraph styles in inDesign CS6 to hopefully help your future page layout projects. First, open the inDesign CS6 application. Once it has launched, select document under Create New. A new document window will appear, for this tutorial edit a one 8.5 X 11in page with 1in margins and no bleed. 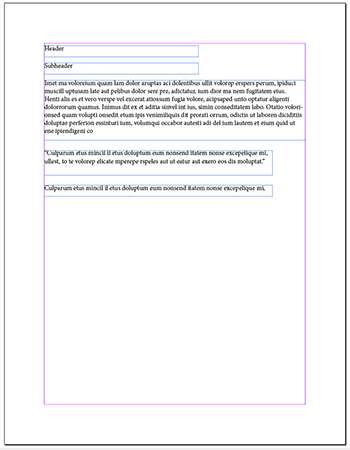 Click OK.
Once the document has loaded, put some filler text on the page using the type tool. To do this, select the type tool on the right toolbar. Click anywhere on the document, drag to the desired width and release to create a text box. 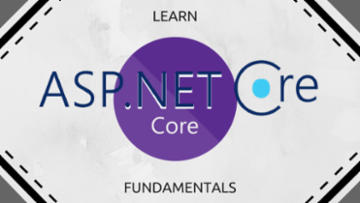 For this tutorial make sure to include a header, subheader, paragraph, quote, and a caption. If you do not want to write content, right-click the text box and select Fill with Placeholder Text. I went ahead and did this for my paragraph, quote, and caption sections. If you are working in the Typography workspace find the paragraph styles panel in the right toolbar. If you do not see it go to Window > Styles > Paragraph Styles.